Shared is an incredibly easy to use cloud storage site that will make it quite simple for you to transfer files to whomever you desire. And since this process is normal in almost any domain it is understandable why you would be interested in learning more about this free storage tool. So, in the following lines you will find the reason why you should go for this program. Let’s face it! You have had enough with those programs that would keep you waiting long hours just for some files to upload and to get shared. Besides that, since this is very easy to use it is understandable why this program is able to save your time. Therefore, stop wasting your valuable time with something else, and experience this amazing tool. I am sure you would like to work with a program that won’t require any installation process and that would be able to be accessed from various devices. Well, in this case you should definitely go for Shared. Here all you will have to do is to sign up and then you will be allowed to use this program to upload files, to share or to store them. It is all up to you! Once you have uploaded your files on this file hosting tool there is no reason to worry that your documents will be devoid of the privacy that your business requires so much. The people behind this project will make sure that everything will be safe and private, which is why you are the only person who will decide whom to send the files to and which files will be transferred. Therefore, you could trust this website because nothing will happen to your files. In case you wouldn’t like to invest some money in this affair, you should pick the free edition. It includes a lot of advantages, although it has fewer features than the Pro plans. Anyway, you will still manage to have your job done easily. As far as the Pro options are concerned your benefits will be numerous, for instance you will receive up to 2TB of storage. But, it all depends on you and on the budget of your company. Making money with Shared is very easy, if you will join their referral program. This means that you will have to bring people to Shared and when they have opted for a Pro account you will receive 30% of the sale. 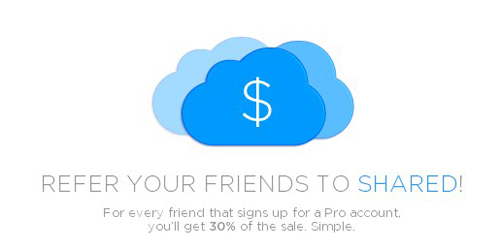 Besides that you will get an additional 30% when your friend’s subscription will be renewed. Also, you don’t have to be a Pro user, in order to get into the referral program, anybody could do it. So, if you are interested in this business you should join this program and start earning extra money. To conclude, these are the most important reason why one should go for Shared. As you can see, this is a great program that will bring you privacy, simplicity, speed, and the list may continue.